Super Savings Item! Free Shipping Included! Save 38% on the Synopsis 'Lex Ecclesiae Fundamentalis' (Canon Law) by Peeters Publishers at Translate This Website. Hurry! Limited time offer. Offer valid only while supplies last. In the period from 1965 to 1980, seven concepts and two alternative concepts of a fundamental church law ''Lex Ecclesiae Fundamentalis'' circulated. 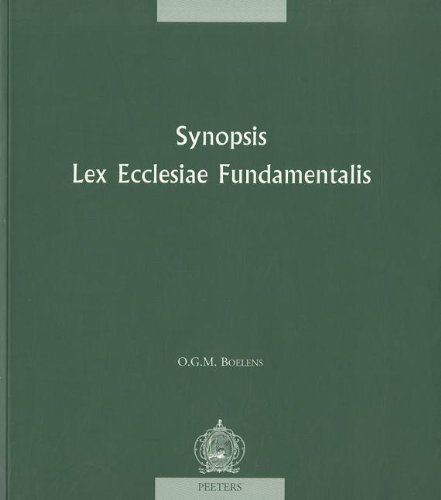 In the period from 1965 to 1980, seven concepts and two alternative concepts of a fundamental church law "Lex Ecclesiae Fundamentalis" circulated. However, this fundamental church law was never promulgated. Heidelberg and by the Institute for Canon Law at the University of Munich. They show clearly the sensitive points for the Evangelist canon lawyers, in comparison to the seven concepts by catholic canon lawyers. these nine concepts side by side, this Synopsis wants to be an essential tool in understanding the constitutional law thinking within the Church in the 20th Century.